Where can you find lodging that offers elegance and comfort, a natural paradise just steps away from a charming town square, and a big welcome mat for you and your furry companion? 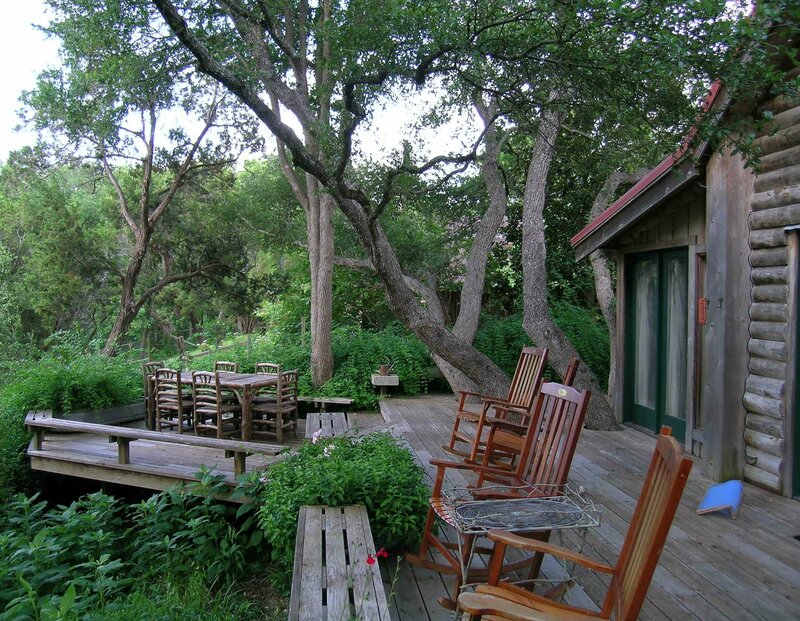 At Abundance – A Hill Country River Retreat in Wimberley, Texas, just 3 hours West of Houston nestled between Austin and San Antonio. Abundance features 2 unique and distinctive guesthouses: Sundance Lodge and Moondance Cabin. Sundance is a large log home with 2 fireplaces; a Great Room that is truly great; an inviting pine log den with overstuffed leather chairs and stone hearth; and an expansive outdoor living area equipped with a kitchen, 2 picnic areas and 2000 square feet of decks and patios. Moondance is a deluxe log cabin appointed with Cypress and Cedar furnishings handcrafted by a local artisan, a wood burning stove and a Texas native stone hearth. Your cares will melt away in Moondance’s oversized corner whirlpool tub and private cedar sauna. Dogs and cats alike enjoy deer, bird and squirrel watching from the comfy couches and rocker-furnished porches of both homes. “Inspirational” best describes the park-like setting that is Abundance. Crystal-clear, spring-fed Cypress Creek winds its way alongside the grounds. You and your four-legged friend can share precious moments watching blue catfish and red-eared slider turtles, hunting for fossils from long-ago oceans, and honoring the setting sun with a toast and a treat. 7 acres of nature trails awaiting your exploration lie just across the creek from Abundance and lead into the heart of downtown Wimberley, the historic Square. Here you will find many pet-friendly commercial establishments. Local ducks and geese may dine or even shop with you at creekside shops and restaurants. In addition to its pet-friendly reputation, Wimberley is well known for its vibrant arts community, numerous shops and galleries, live music and great antiquing, all of which you can enjoy while strolling the Wimberley Square. Outside of downtown, a must-see is the Friday night bluegrass jam session at the Red Rooster. Held under a canopy of Live Oaks, this spontaneous weekly gathering welcomes budding musicians, famous recording artists, and dogs large and small, many of whom have been spotted thumping their paws to the bluegrass beat. Also, you and your poochie friend should make a point to cruise the country roads a bit to delight in the dramatic hilltop views from the popular Devil’s Backbone. Celebrate your past, plan for your future, or simply embrace today with a visit to Abundance for you and your canine or feline pal. Abundance is reserved for Adults and Pets only. Reserve your stay at www.AbundanceRetreat.com or 512-517-0742.